Another Exchange sync app for Android | Android Blast! 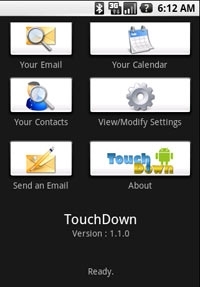 NitroDesk has released TouchDown, "the world's first on-the-phone solution for accessing your Exchange Server email, contacts and calendar on Android-powered handsets." TouchDown works with Microsoft Exchange Server 2007 SP1 and "most" online Exchange hosts. You can do most of the common tasks like compose, send, reply, reply-all, forward and delete emails. You can also manage your contacts and have it updated in your Exchange account.